On November 30 and December 1, the Supreme Court of Canada (SCC) will hear arguments in the Trinity Western University (TWU) appeals. The question: Can the law societies of Ontario and British Columbia refuse to accredit graduates of the TWU’s proposed law school? The point of contention in this case is TWU’s community covenant, which requires all staff and students to abide by biblical morality and abstain from sexual behaviour outside of heterosexual marriage. The resulting discrimination on the basis of sexual orientation is the basis for the law societies’ refusal to accredit TWU. Along with Out in Law and the Journal of Law & Equality, the Asper Centre co-hosted a panel discussion last week to unpack the issues in the upcoming TWU appeals. 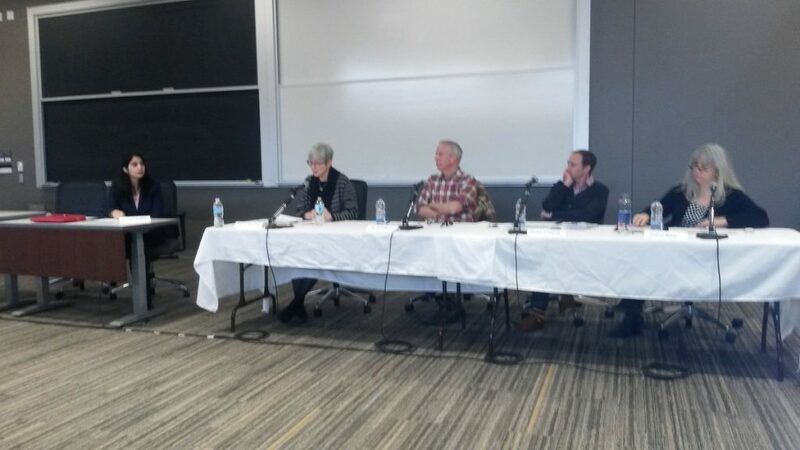 The panelists were Professors Denise Réaume and Richard Stacey from the University of Toronto Faculty of Law, Professor Richard Moon from the University of Windsor Faculty of Law, and the Asper Centre’s Executive Director Cheryl Milne. Though the panelists did not divulge any predictions on how the SCC would rule, each discussed the case from a different perspective. Richard Stacey discussed the mandates of the law societies and their roles as administrative decision makers. TWU claims the law societies are going beyond their mandate in refusing to accredit them. Indeed, Professor Stacey pointed out that TWU graduates would likely qualify for accreditation on the merits of the proposed law school’s curriculum. Public interest concerns are central to the law societies’ arguments. TWU argues that there is no evidence of harm to the public interest and the law societies should not be regulating the religious behavior of its students. A question from the audience concerned whether the SCC can avoid establishing a hierarchy of rights in this decision, something the SCC has long rejected. How are equality rights and freedom of religion to be balanced? Richard Moon commented on how he disagreed with the “balancing of rights” characterization of the cases. The issue is space, not values. Should religious communities composed of willful participants have the space to govern their internal affairs by their own moral standards? Denise Réaume argued that the Charter is less sophisticated in negotiating rights of equal treatment and the rights of others than the Ontario Human Rights Code. The Code (s.18) permits special interest organizations (including religious and educational institutions) to restrict membership to persons of similar identity. Human rights decisions, in her view, have been better at negotiating the boundaries of the competing rights claims, than what has transpired under the Charter. The granting of exclusive space is limited to private and internal affairs. The Law Society of Ontario argues that the TWU community covenant has a negative external impact, arbitrarily limiting access to the legal profession on the basis of sexual behavior preferences. Furthermore, discriminatory admissions criteria compromise merit based admissions. The community covenant only pertains to behavior. TWU welcomes LGBTQ students, so long as they are willing to sign and abide by the community covenant. It defines acceptable behavior, not identity per se. To what extent are behavior and identity really so separable? Cheryl Milne discussed the procedural idiosyncrasies of the TWU appeals in relation to the treatment of the interveners. Many LGBTQ advocacy groups applied for intervener status. Initially, none were accepted. The social media response motivated the Chief Justice and Justice Wagner to reconsider the involvement of the interveners. The resulting second order of the Chief Justice was unprecedented. The Court announced in a news release that it had reconsidered the scheduling of the appeal and a second day of hearings would be added. All interveners who applied and were previously rejected would now be heard. A total of 30. Motions are usually final. The SCC does not usually give reasons for its selection of which interveners get in and which do not. And, the announcement was followed by a media interview. The social media reaction was cited as a reason for the court’s decision. Very unusual. The quantity of interveners is also unusual. Milne questioned the value of having 30 interveners. Is the 26th given the same attention as the 3rd? The TWU appeals have already set SCC procedural precedent. It remains to be seen what precedent the decision will set.